One of the main reasons why cancer has been so hard to prevent, and so difficult to treat, is that we knew very little about the disease for a very long time. However, over the past two decades, many of the intricacies of the disease have been carefully unravelled, and what we have learned is straightforward and incredibly important. Please take a few moments to follow the explanation below. There are an estimated 50 trillion cells in the human body. Each cell contains 23 pairs of chromosomes made up of roughly 3 billion bits of DNA code. These cells are the building blocks that make up all of our bodily systems and each cell has a specific role to play. The cells all have a great number of (and a wide variety of) receptors on their outer surfaces that allow them to respond to changes in their external environment. For example, when a cellular receptor is triggered by the presence of an external chemical, the signal that results is carried into the cell and the DNA then provides instructions that allow the cell to respond appropriately. All of these cells have the ability to grow, divide and replicate (i.e., make copies of themselves), a capability that is needed during growth and for ongoing renewal. However, when cancer begins, misbehaving cells somewhere in the body begin to grow, divide and replicate even though they shouldn’t be doing so. As these cells make copies of themselves, the resulting cells crowd into the space where they are being created. 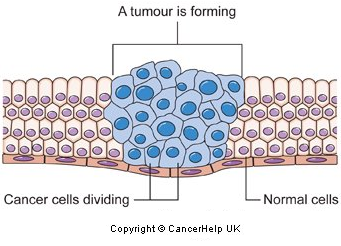 Without adequate space, the cells then form tumors. For many decades, physicians and scientists could see these tumors, but they simply didn’t have the tools to understand what was happening at the cellular level. However, as technology has improved, research has progressed and we now know that all cancer types share ten common hallmark characteristics. Malignant cancerous cells invade nearby tissues, and ultimately enter the blood stream or lymph system, which allows them to spread and colonize in other parts of the body. These shared characteristics have been described in the scientific literature by Hanahan and Weinberg (The Hallmarks of Cancer: The Next Generation Cell - 4 March 2011, Vol. 144, Issue 5, pp. 646-674), and they are also depicted below. This holistic framework of hallmarks appears relatively straightforward, but it belies the underlying complexity of the disease. There is actually a great variety of aberrant genetic pathways that can be used to achieve each of these hallmarks, and these different pathways can vary significantly in the cells within any given type of cancer or instance of cancer. Nonetheless, these hallmarks provide us with a much more nuanced understanding of the disease, one that is often glossed over in most non-academic discussions on the topic. Each of these hallmarks represents a major mechanism that contributes to the disease, and each one is a discrete mechanism that involves the interactions of complex ensemble of biological machinery. 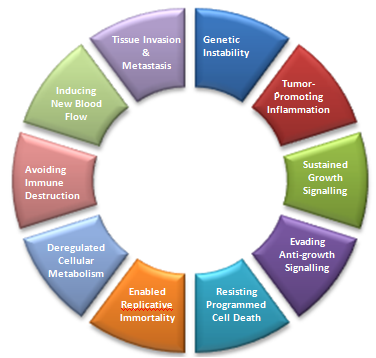 The pharmaceutical industry has seized on this new knowledge by launching many new chemical therapies for cancer that are precisely targeted at cellular receptors and signal transduction pathways that impact these major mechanisms. Yet, for decades, in our efforts to protect ourselves, we have been focused on finding complete carcinogens (i.e., single chemicals or other individual agents that can single-handedly instigate all of these hallmarks). Now it is clear that complete carcinogens were just the tip of the iceberg. If we really want to reduce the incidence of cancer, we also need to focus on disruptive chemicals that are capable of acting on any number of these discrete mechanisms and contributing to disease causation (because if a number of disruptive chemicals combine to instigate all of these hallmarks, they can still cause cancer, even if none of the chemicals are capable of causing cancer on their own).